For decades, we have known that heavy metals and chemicals can cause grave physical harm. Going back to Rachel Carson’s “Silent Spring,” we have known and been amply warned of the serious consequences of using or being exposed to these poisons in our daily activities. Thousands of these are well-documented carcinogens. Building on Carson’s ground-breaking research, we also know that certain kinds of chemicals can and do disrupt human [and other animals’] entire immune system. Going back 30 years, researchers were investigating what became known as endocrine [hormone] disrupting chemicals and how they were affecting frogs [who sometimes had five legs or hermaphroditic characteristics], other aquatic animals, and mammals. These animals were the proverbial canaries in the coal mine. In another pioneering book, “Our Stolen Future,” authors Dr. Theo Colburn, Dianne Dumanoski, and John Peterson Myers clearly demonstrate that 1 + 1 hormone-disrupting chemicals did not equal 2. Although this information, on the dangers of hormone disruption, is now more widely available on Internet sites, it still is not well known by the average person who gets news mostly from mainstream media. (1) Most of these highly toxic chemicals are invisible; and, therefore, are easily off our collective radar. With the high stress level created by the deliberately orchestrated financial crisis –where millions have lost their jobs and homes– a degraded/collapsing environment or serious health problems are not priorities –especially, if very little is reported in mainstream news. This disaster scenario is part of the larger picture of what Naomi Klein writes about in her book “The Shock Doctrine.” We have so many major crises, one after another, that it is hard just to keep up with one’s daily routine –let alone have time to read and consider the toxicological health ramifications of massive amounts of thousands of heavy metals and chemicals that have poisoned our entire food chain and, thus, our own supposed “health.” We are at the very top of this wrecked food chain. Now, however, there is another far more insidious layer of toxicity that is not being addressed at all in any mainstream, corporate-controlled news, and it is affecting our very survival. It is, however, being addressed more and more by independent researchers who have supporting evidence to back up their Internet reports. For more than a decade, first the United States and then Canada’s citizens have been subjected to a 24/7/365 day aerosol assault over our heads made of a toxic brew of poisonous heavy metals, chemicals, and other dangerous ingredients. None of this was reported by any mainstream media. The US Department of Defense [DOD] and military have been systematically blanketing all our skies with what are known as Chemtrails (also known as Stratospheric Aerosol Geoengineering). (2) These differ vastly from the usual plane contrails that evaporate rather quickly in the sky. Chemtrails do not dissipate. 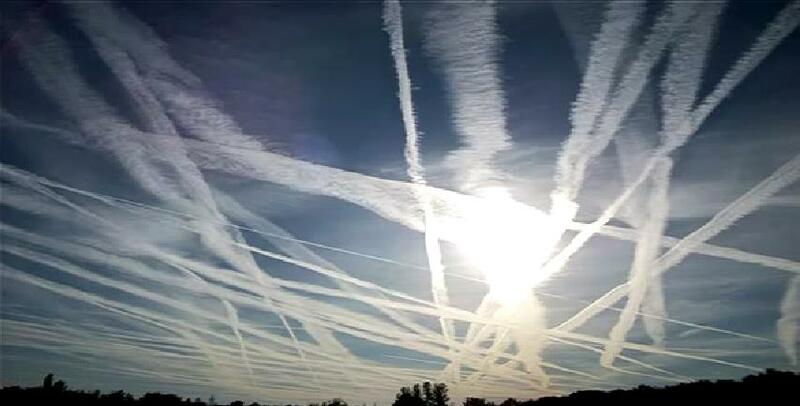 Rather, planes (fitted with special nozzles) release aerosols “lines” in the sky that do not evaporate. Multiple planes are deployed, flying parallel (or often “checkerboard” patterns) overhead; and soon the sky is blanketed with many grayish-white lines [miles and miles long, although this is changing]. At first, these lines are thin; but soon they expand and, in a short time, merge together. Our once-blue sky has vanished and has been replaced by a grayish-white toxic haze that blots out and greatly diminishes our usual sunshine. 2. Asthma and upper respiratory illnesses. Between 100-150 million people suffer from asthma worldwide. In the US, 16.4 million adults have asthma and 7 million children have it. Chronic bronchitis and emphysema: 9.8 million Americans were diagnosed with chronic bronchitis this past year; for emphysema the figure is 3.8 million. (10) Total: 37 million Americans afflicted. In Canada, 2.4 million have been diagnosed with asthma. 3. Particulate matter in air pollution. Particulate matter [PM] consists of tiny particles 10 microns or less. [1 micron is about 1/70 the thickness of a single human hair.] These particles can lodge in the deepest part of your lungs; and over a period of time, they can damage lung function. This kind of pollution, that we breathe daily, can and does cause various upper respiratory illnesses, coronary heart disease, and premature aging and death. Particulate matter can also exacerbate any existing illness. (11) Unanswered questions: Does hazardous particulate matter act in synergistic ways in human bodies (as do endocrine disrupting chemicals)? How does PM affect millions who already have multiple chronic illnesses? Even with the increases in preventable illnesses, the issue that has not been linked or addressed –with what Clifford Carnicom rightly calls “aerosol crimes”– is the deterioration of cognitive function. Our immune system is already under siege daily; and this has resulted in millions (possibly billions) of people with not just one illness, but often multiple ones. The skin, the largest organ in our body, is a permeable membrane. This means that invisible toxins in our air, including Chemtrails and other highly dangerous chemicals, go right into our skin. Poisoned rainwater (or snow touching our skin) does the same thing. When the air we breathe is filled with a dangerous assortment of toxins, with each breath we take, these poisons assault our entire immune system. These poisons also affect our brain and, thus, our cognitive function. Aluminum is a major component in these aerosols. Although it is our planet’s most abundant metal, our body has no biological need for it. Pesticide Action Network North America [PANNA] lists it as “toxic to humans, including carcinogenicity, reproductive and developmental toxicity, neurotoxicity, and acute toxicity.”(12) Yet, aluminum is commonly used [this is a very short list] in vaccines, deodorants and anti-perspirants, over-the-counter medications, soft drink and beer cans [aluminum leeches from the cans], baking powder, cake mixes, processed cheeses, and other food products and additives. Over years, aluminum accumulates in the brain, tissues, and to a lesser amount the bones. It causes brain degeneration, dysfunction and damage –due to the blockage and reduced blood flow and oxygen of brain arteries. The brain shrinks, as brain cells die. This causes dementia. Symptoms include: emotional outbursts, paranoia, forgetfulness and memory loss, speech incoherence, irritability, diminished alertness, changes in personality, and poor/bad judgment. All these are on the rise, as more than 4-million Americans are afflicted. Brain deterioration and dementia take decades to cause serious and visible harm. Eventually, however, dementia is fatal. “Alzheimer’s” is now being used incorrectly as a catch-all term for all kinds of dementia. Just a few days ago, the front page of the New York Times had a headline: “More with Dementia Wander from Home.”(13) People afflicted with, what the Times terms “Alzheimer’s” were interviewed. One person mentioned he “has a diagnosis of Alzheimer’s.” This is patently wrong. Alzheimer’s dementia can only be accurately diagnosed after death when a post-mortem can be done. However, heavy metals poisoning can be diagnosed through lab testing; but this is rarely done for basic check-ups. What is not addressed in this increase in dementia is the more than 10 years of breathing Chemtrails with nano aluminum-coated fiberglass. Billions of tons have been sprayed on us. With all these sources of aluminum added to the air we breathe with each breath, the cumulative toxicity is very high. Even in daily events, it is obvious –to anyone who is paying attention– that many people are behaving oddly. While it may be considered “anecdotal” reporting, there are millions of people whose behavior is strange. There have been numerous times in just the past year when I have asked someone a question and received an answer that is totally unrelated. There have been more and more uncontrolled outbursts in public areas: someone “snaps” for no apparent reason. Violence levels are up. Look at all the shootings on school campuses. There are more unexplained auto accidents that never should have happened. In just one day a few weeks ago, I witnessed three traffic accidents that need not have happened. The news is full of these stories. Add to this already highly toxic body burden is the US military’s use of aluminum in its aerosols. It is used because of its electrical conductivity, durability, and light weight. The US Air Force reported in 1997 that it released “2 million, 6-7 ounce bundles of CHAFF.” These are laid by military aircraft form 15-50 miles in length. (14) Another unanswered question: Why is the USAF not releasing up-to-date figures? A 2002 report notes that: “over the last 25 years, the US Navy [has released from planes] several hundred thousand pounds of aluminized chaff during flight operations over a training area on the Chesapeake Bay.”(15) If the Navy used hundreds of thousands of pounds in just this small area of the US, what could be extrapolated for the release of possibly billions of tons of nano aluminum by all the military divisions throughout the US and Canada more recently than 2002? CHAFF is being stored that has lead in it. Has that been released, without our knowledge, and added to these aerosols? What enormous, yet invisible, harm has that created for all of us? Dr. Hildegarde Staninger reported last year that “exposure to aerial emissions of nano composite materials resulted in cholinesterase inhibition.”(16) The human body has three kinds of cholinesterase: for the brain, for plasma (manufactured by the liver), and red blood cells. Some pesticides and nerve gases (such as VX, an organophosphate) inhibit cholinesterase. The chronic inhibition of this enzyme (that normally circulates in red blood cells), caused by the spraying of these Chemtrails aerosols [for weather modification, but also used for mosquito and other insect eradication], causes chronic poisoning. This exposure causes severe neurological disorders, including paralysis in humans. In a ground-breaking 2003 online essay, Dr. Kaye Kilburn, asks: “Why is Chemical Brain Injury Ignored?”(17) His article lists 13 concealed factors that affect our willingness to believe that dangerous chemicals do affect the brain. They include: 1. “It’s all in your head” [meaning real symptoms are ignored by allopathic medicine]. 2. Resistance to vulnerability [individuals, and society collectively, cannot believe the brain is at risk]. 3. The acceptance of mind-altering prescription drugs [such as Paxil] that can and do affect the brain [millions are on anti-depressants –what long-term damage does that also do to cognitive thinking?]. 6. Delay in acknowledging health risks. 7. Economic interests [delaying tactics by big corporations are well known –delay continues profits and ignores taking responsibility –We are all expendable for corporate profits]. 8. The field of neurology has been slow to consider causes [how many independent researchers are left who do not have any ties to the pharmaceutical/chemical companies?]. It seems almost unbelievable that millions/billions of people could look up at the sky and not notice the dramatic changes that have occurred from what it was, for instance, in the mid-1990s. Then our sky was a gorgeous, deep blue. Clouds were a beautiful assortment of shapes. The sun was glorious. But people under 30, may not have a real sense of recollection about looking up every day and seeing this panoramic magnificence. Most of them are too busy texting or chatting on their cell phones. There are other issues to consider, as well: People are in their own comfort zones; and denial is a very powerful human emotion. In the hustle and bustle (now quite out of hand, for reflective time), how many people look up at the sky? It also takes huge courage, a very deep, internal willingness to examine politically motivated corporate controlled media spin, and search for the real answers. Humans like their regular routines. To re-examine what we think we know, based on new evidence, takes a willingness to think outside the proverbial box; to want to find out the truth –not the pervasive Orwellian doublespeak that pervades our society. If everything in our daily routine belies what is truly going on, it requires fortitude to explore the unknown –to question the litany. Given these issues, since our collapsing society has so many different levels of deceit –the financial debacle, the lies and deceit of government and the Federal Reserve blaming people for the housing/mortgage nightmare, the emerging police state, the disasters that envelope our fragile environment– it becomes increasingly difficult just to maintain a daily routine and survive the economic depression and its daily fallout. Mainstream media does its supporting role and deceives us. Millions, like the proverbial lemmings, hasten to join the group demise. There are countless historical instances of this collective insanity. We Homo sapiens [sic, wise men?] have never learned the lessons of 5,000 years of history. This is because each new generation of corrupt political leaders (often tied historically to previous ones) never has the real interest of their constituents as a basic part of their political practice. Further, there is no Precautionary Principle in place. (19) It’s not the way the political game of deception works. Precaution is not part of an equation that is broken from the beginning. Humans are gullible and want to believe the Orwellian deceptions. To add to this already heavy burden, to ask uninformed, although supposedly “well educated” [What does that actually mean, given that much of our higher education has omitted much of what Prof. Peter Dale Scott calls “deep political events” that never get into our history books?] people to reconsider what they think they know about what is really going on –this takes enormous internal strength. It requires profound courage. The basis of this “courage” actually means creating new synaptical pathways in the brain. Without them, we feel scared, nervous…because those new synapses have not yet been created. It takes repeated effort, and, thus, an emerging sense of ease, to create these new synapses. If, however, millions of people are already on prescription pharmaceuticals to “calm them down” [long term, what is this doing to their ability to think clearly?] and, in addition, are breathing poisoned air rife with mind-distorting chemicals, then how clearly (if at all) is anyone able to think? How can anyone feel well and safe, if the very air we breathe is deliberately poisoned and is affecting our ability to think cogently? It is already evident that no one in any official capacity is willing to tell the truth. It is like Diogenes, the ancient Greek, searching for a truthful individual. No one seems to have the desire, or courage, or authority to stop this massive poisoning, because it is the secret plan of the elite insiders to deliberate destroy everything we once knew. Our BASIC human rights, constitutional and international laws are mere paper. These rights and laws have all been torn asunder by those in charge. It has been done by stealth. We must organize peacefully. PEACEFULLY is the operative word. If these many-pronged aerosol attacks by military and commercial planes can spray these horrific toxins on us, year after year with impunity –against all laws– then it is absolutely imperative that we organize peacefully. As Peter Dale Scott notes in Jason Bermas’ new DVD “Invisible Empire”: we must use the Internet and our peaceful intellectual powers to come together and shut this nightmare down. It is possible to do this.